I always enjoy finding pictures of great artist's working, even (sometimes especially) if they are staged. The more authentic pictures can be more informative, it is fun to try and identify the work habits of the greats. The staged ones are great too because they are often so silly and obvious. To start us off, who can tell me who this dapper gent is? Unfortunately this one smacks of the staged variety, with one of his most famous paintings openly displayed. I think your title may have given the answer away. 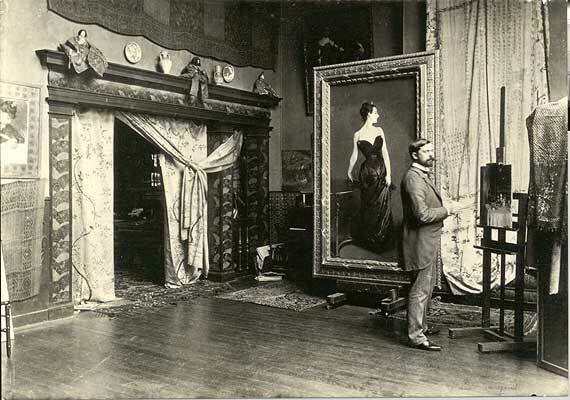 Having John Singer Sargent in front of Madame X is like having Da Vinci in front of the Mona Lisa! HA! true enough, but if someone doesn't know who painted Madame X they probably wouldn't know anyway.